120 mm/40 10th Year Type mod. B21 х 1 pcs. 610 mm Twin2 х 2 pcs. 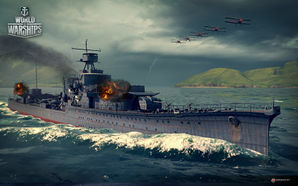 Yūbari — Japanese promo premium Tier IV cruiser. An experimental light cruiser based on an idea to create a fast warship carrying the most powerful armament available while having minimum displacement. She was the first in the Imperial Japanese Navy to be equipped with 610 mm torpedo tubes. By the end of her time in service, Yūbari was reinforced with numerous AA guns. Yūbari was was first sold in pre-order bundles from 8 April through 25 June 2015. First available available during the World of Warships Closed Beta Test as a pre-order, Yūbari is a fairly mediocre Japanese cruiser for Tier IV. She compliments her slow-turning turrets with a pair of twin-tube torpedo launchers with a 6km range. Compared to all of her Tier IV counterparts, Yūbari has the lowest detectability range of all: just under 10km. Where Yūbari really lacks, however, are her guns. With only 140mm diameter the shells are quite small and can have a hard time penetrating other cruisers. Premium experience, credit-earning, and commander training. Lowest tier ship in the game to have access to the Defensive AA Fire ( ) consumable. Destroyer like rudder shift time and mobility. The AA suite is decent, but not outstanding. Defensive AA Fire ( ) consumable only has one use (two with premium). Mediocre gun performance (slow traverse, high arc, low DPM and penetration). Only 2 turrets (losing one will lead to a 90 degree blind spot where you have no firepower and 50% loss in damage output). Very little armor and fragile modules, similar to a destroyer. 6,000 less HP than same-tier cruisers (again, almost destroyer level). Very narrow torpedo launch angle. Torpedoes lack the range of Tenryu and Kuma. As a premium ship, Yūbari doesn't have any upgrades to research. Mounting the premium version of Damage Control Party ( ) is recommended to reduce its cooldown timer. The premium version of Defensive AA Fire ( ) is also recommended to provide an additional charge of this consumable. As a premium ship, Yūbari comes included with Type 9 camouflage that lowers her detection radius, reduces the accuracy of incoming shells, and increases the amount of experience she earns. Yūbari captains should mount the standard flags to improve the ship's performance in battle. To improve upon the ship's armaments, India X-Ray ( ), Victor Lima ( ), and Juliet Whiskey Unaone ( ) flags are recommended to increase the fire chance and flooding chances respectively. To improve the ship’s survivability, captains should mount November Foxtrot ( ) and India Yankee ( ) flags. Sierra Mike ( ) flags are recommended to increase the ship’s already high top speed. Lastly, economic and special signal flags can be mounted to improve the ship’s economic gains per battle. Yūbari at anchor, date and location unknown. Originally ordered under the 1917 8-4 program, Yūbari was constructed as the main base for the upcoming new and 'modern' Japanese cruiser design of its time. The famous Japanese naval architect Yuzuru Hiraga oversaw her construction, and would later on incorporate his ideas (of weight reduction as well as outfitting ships with maximum firepower possible into a given displacement) into the later cruisers, such as Furutaka. In 1914, the Japanese government unofficially declared the 8-8 program, which would be in accord with Japan's interests in the Far East. As it's named, the 8-8 program was a plan to build a fleet consisting of eight battleships and eight battlecruisers, and the lifespan of the capital ships being eight years. However, due to Japan's lack of financial and industrial power at the time, the plan was reduced to the 8-4 in 1917. Be that as it may, as the years passed along, Japan's financial and industrial power grew and became sufficient that by 1920, the 8-8 program was restarted. In response to the US refusing to ratify the Treaty of Versailles of World War I, the Japanese began their naval arms race with the US. 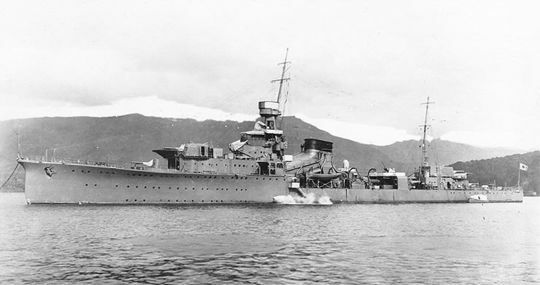 In 1922, Yūbari was laid down as an experimental light cruiser scout that would have as much firepower as the Sendai-class cruiser, but with far lighter displacement. Due to the idea of making the ship as light as possible, the armor would be incorporated into the belt armor at 38 mm thick and the deck armor 28 mm, which was far better than earlier 5,000-ton cruiser designs. The engine was designed similarly to a destroyer, with only one smokestack, to reduce overall length and save deck space, and eight boilers feeding into three turbines- this gave Yūbari the desired speed of 35 knots. Additionally, she was originally outfitted with 3x2 14cm/50 3rd Year Type naval guns, but in her 1944 refit, the A position main battery turret (front-most turret) was replaced by a 120mm AA gun. As such, she is seen in-game with the 1944 outfit. Light and dark green camouflage was only applied to aircraft carriers. Yubari’s overall dark gray paint scheme is missing. This was standard on all Japanese warships beginning in 1903 until the end of World War II. A simple solution would be to demount the permanent camouflage, but players will not be able to benefit from the camouflage's bonuses. Yubari is represented in her 1944 configuration. Max speed should be 32 knots, not 34.5 knots. This page has been accessed 67,093 times.